Jacob Levy has a very interesting bloggingheads exchange with Will Wilkinson. At least it’s interesting if you want to understand what the hell just happened up in Canada, politically. That whole ‘didn’t the queen shut down parliament, or something?’ thing. If that interests you. Finally, my Haeckel post didn’t get many comments (sniff), but I actually got quite a bit of interesting email. Some thoughts about Haeckel’s influence and philosophy and so forth. Me? Obviously I focus on the comics angle. But lemme work up. Almost a year ago I noted that Pepin Press has, very strangely, decided to use Plate #17 from Kunstformen as the cover of its forthcoming history of ornament. Or maybe it’s just a good joke until they come up with a real cover. But truly. There is something about Plate #17. 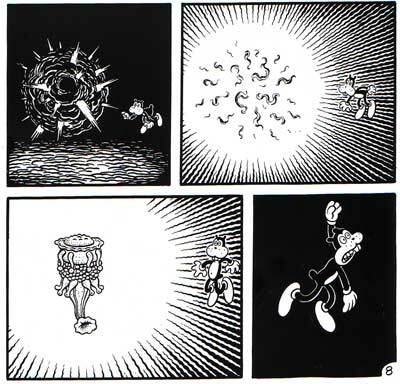 In Jim Woodring’s The Frank Book [amazon], one of the better bits is “Frank And The Truth About Plenitude”, in which Frank catches and rides around on a ‘Jiva’. (That’s the thing you see him doing on the cover, for example.) But then, this and that, he dives deep in the ocean and sees a siphonophore, copied straight out of Haeckel. Apparently, seeing this creature from Haeckel causes him to appreciate plenitude for the first time. He goes and frees his captive Jiva, etc. He sits and looks at art. I like that Haeckel himself apparently had the same rapturous experience of plenitude as Frank. Here is Woodring’s account of what a Jiva is, by the by. Jivas are conditioned souls. Temporarily confined to the liberating prison of radial symmetry, they writhe joyously in the welkin, drawn to the bliss of the eternal interval. But while their subtle bodies are nuzzling the absolute, the multicolored skins are available to Frank and his friends for riding or target practice. Jivas are independent; they are slow to notice and interact with Frank and his associates, but when they do the results can be appalling. FYI, both links are to Yglesias. The NY Times link. Let me be the first to wish you A Very Haeckel Christmas! Jivas are also the tiny soul essences of all living beings in Jainism, and it is the thoughtless killing of them that besmirches our own jivas, requiring painful austerities to purify ourselves, etc.. Jivas are everywhere: they are the myriad tiny animalcules inhabiting, um, er, many places, including, ah, female genitalia, which makes sexual activity a pretty iffy proposition for a Jain. Meanwhile back to Haeckel. His reference to ‘matter and energy’ sounds very like that wonderfully titled and very 19th century German materialist tract, Kraft und Stoff, whose message is: that’s all it all is. I would so like to write a book with that title. But, alas, it’s already taken. There’s a Queen of Canada?